HP 61 Black Ink Cartridge (CH561WN), HP 61 Tri-Color Ink Cartirdge (CH562WN), 2 Ink Cartridges (CR259FN). HP 61 ink cartridges work with: HP Deskjet 1000, 1010, 1012, 1050, 1051, 1055, 1056, 1510, 1512, 1514, 1051, 2050, 2510, 2512, 2514, 2540, 2541, 2542, 2543 2544, 2546, 2547, 3000, 3050, 3051, 3052, 3054, 3056, 3510, 3511, 3512HP ENVY 4500, 4502, 4504, 5530, 5531, 5532, 5534, 5535. HP Officejet 2620, 2621, 4630, 4632 HP 61 ink cartridge yield (approx.) per cartridge: 190 pages black, 165 pages tri-color. Up to 2x more prints with Original HP ink vs refill cartridges. Original HP ink cartridges are specially designed to work with your printer to consistently deliver standout results throughout the life of your cartridge. Ensure that your printing is right the first time and every time with HP printer ink: 61 ink. What's in the box: New Original HP 61 pack of 2 ink cartridges (CR259FN): 61 black ink cartridge (CH561WN), 61 tri-color ink cartirdge (CH562WN) Colors: Black, tri-color. 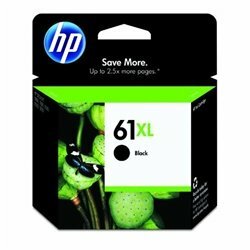 HP 61XL Black Ink Cartridge, Black High Yield (CH563WN). 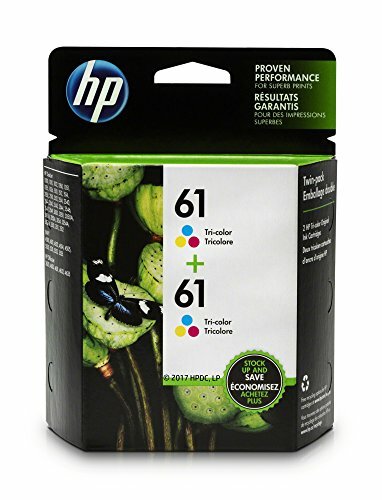 HP 61 ink cartridges work with: HP Deskjet 1000, 1010, 1012, 1050, 1051, 1055, 1056, 1510, 1512, 1514, 1051, 2050, 2510, 2512, 2514, 2540, 2541, 2542, 2543 2544, 2546, 2547, 3000, 3050, 3051, 3052, 3054, 3056, 3510, 3511, 3512HP ENVY 4500, 4502, 4504, 5530, 5531, 5532, 5534, 5535. HP Officejet 2620, 2621, 4630, 4632 HP 61 XL ink cartridge yield (approx. ): 480 pages. Get up to 2X the pages with Original HP XL ink cartridges compared to standard cartridges. Original HP ink cartridges are specially designed to work with your printer to consistently deliver standout results throughout the life of your cartridge. Ensure that your printing is right the first time and every time with HP printer ink: 61 ink. 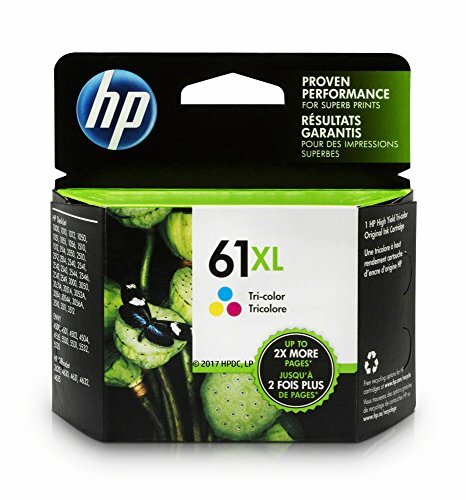 What's in the box: New Original HP 61XL ink cartridge (CH563WN) Color: Black. 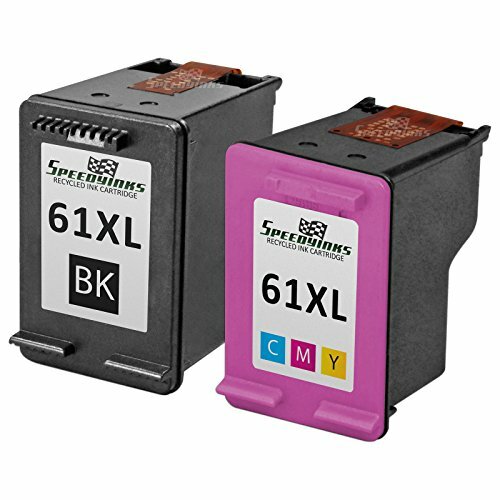 Save even more with our 2 pack of professionally remanufactured HP 61XL (CH563WN) High Yield Black Inkjet cartridges. 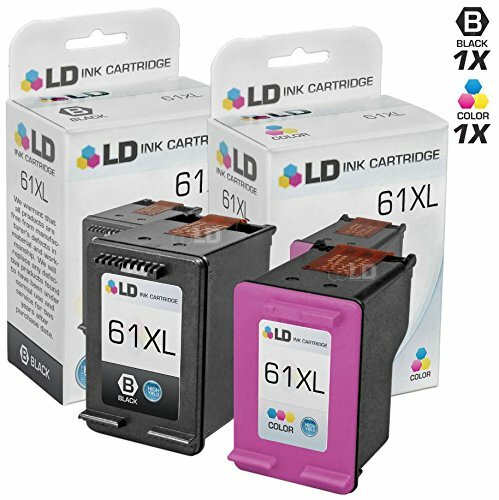 This set includes 2 HP CH563WN (HP 61XL) high yield inkjet cartridges. These LD remanufactured ink cartridges have been thoroughly cleaned along with the printhead nozzles. Following the cleaning process, we refilled the cartridge with a professionally manufactured pigment-based ink formula for archival print life and color stability. This ink formula is specially designed to produce vibrant and long-lasting prints comparable to HP. After carefully inspecting the shell for leakage and monitoring the electrical circuitry for efficiency, we put the cartridge through a final print test to be certain it is worth of our 100% money-back guarantee. Our remanufactured ink cartridges are not remanufactured by HP. So stock up now and save even more! This combo set works with the following HP Printers: Deskjet 1000, 1010, 1015, 1050, 1051, 1055, 1056, 1512, 2050, 2510, 2512, 2514, 2540, 2542, 2545, 2547, 3000, 3050, 3050A, 3051A, 3052A, 3054, 3056A, 3510, 3511, 3512, 3516 & ENVY 4500, 4504, 4505, 5530, 5531 & Officejet 4630, 4632. We are the exclusive reseller of LD Products brand of high quality printing supplies on Amazon. 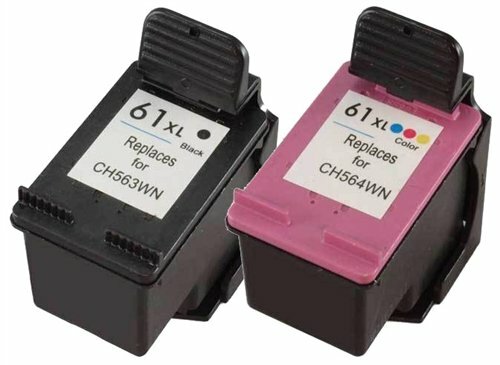 Remanufactured Hewlett Packard HP 61XL High Yield Set of 2 Ink Cartridges: 1 Black (CH563WN) & 1 Color (CH564WN) For use in HP Deskjet 1000, Deskjet 1010, Deskjet 1050, Deskjet 1051, Deskjet 1055, Deskjet 1056, Deskjet 2050, Deskjet 2510, Deskjet 2512, Deskjet 2514 All-in-One, Deskjet 2540, Deskjet 2542 All-in-One, Deskjet 3000, Deskjet 3050, Deskjet 3050A, Deskjet 3051A, Deskjet 3052A, Deskjet 3054, Deskjet 3056A, Deskjet 3510, Deskjet 3511, Deskjet 3512, Deskjet 3516, ENVY 4500 e-All-in-One, ENVY 4504 e-All-in-One, ENVY 5530 e-All-in-One, ENVY 5531 e-All-in-One, OfficeJet 4630 and OfficeJet 4632. Our remanufactured ink cartridges are not remanufactured by HP. We offer a One-Year 100% Quality Satisfaction Guarantee on our remanufactured ink cartridges. HP 61 Tri-color Ink Cartridge (CH562WN), 2 Ink Cartridges (CZ074FN). HP 61 ink cartridges work with: HP Deskjet 1000, 1010, 1012, 1050, 1051, 1055, 1056, 1510, 1512, 1514, 1051, 2050, 2510, 2512, 2514, 2540, 2541, 2542, 2543 2544, 2546, 2547, 3000, 3050, 3051, 3052, 3054, 3056, 3510, 3511, 3512HP ENVY 4500, 4502, 4504, 5530, 5531, 5532, 5534, 5535. HP Officejet 2620, 2621, 4630, 4632 HP 61 ink cartridge yield (approx.) per cartridge: 165 pages. Up to 2x more prints with Original HP ink vs refill cartridges. Original HP ink cartridges are specially designed to work with your printer to consistently deliver standout results throughout the life of your cartridge. Ensure that your printing is right the first time and every time with HP printer ink: 61 ink. What's in the box: New Original HP 61 pack of 2 ink cartridges (CZ074FN): 2 tri-color 61 ink cartridges (CH562WN) Color: Tri-color. Designed to handle the toughest tasks with ease. You can rely on crisp, clean printing with reliable results. Spend less time replacing ink and more time printing. Device Types: Inkjet Printer; OEM/Compatible: OEM; Page-Yield: 10000; Supply Type: Ink. Save and print even more when you shop with LD Products! 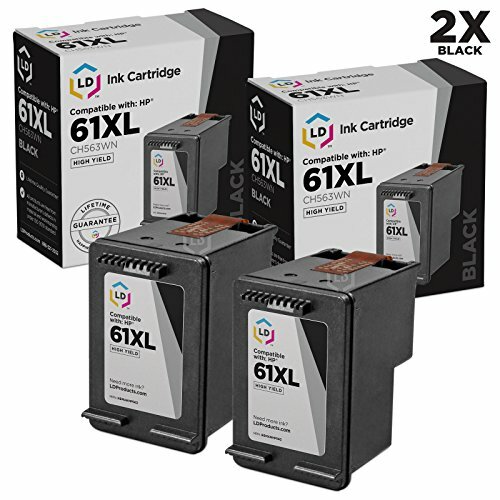 This listing contains (1) 61XL (CH563WN) high yield black, (1) 61XL (CH564WN) high yield color ink cartridges, and (1) FREE 20-sheet pack of 4x6 high quality, glossy photo paper! Why pay twice as much for brand name Hewlett Packard cartridges when our remanufactured printer supplies are backed by a two-year warranty and guaranteed to meet or exceed the same quality standards as the original (OEM) brand? 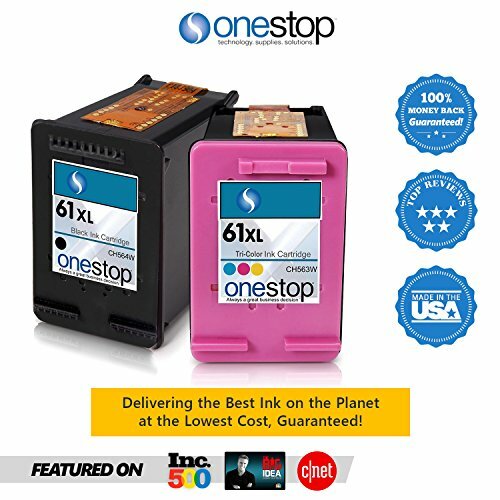 These cartridges are compatible with HP Deskjet 1000, 1010, 1015, 1050, 1051, 1055, 1056, 1510, 1512, 2050, 2510, 2512, 2514, 2540, 2541, 2542, 2543, 2544, 2545, 2547, 3000, 3050, 3050A, 3051A, 3052A, 3054, 3056A, 3510, 3511, 3512, 3516, Envy 4500, 4501, 4502, 4503, 4504, 4505, 5530, 5531, 5535, OfficeJet 2620, 4630, 4632, 4634, 4635. Please note, retail packaging may vary and these cartridges will only work with printers purchased within the United States and Canada. The use of remanufactured cartridges does not void your printers warranty. LD remanufactured ink cartridges are not manufactured by HP. We are the exclusive reseller of LD Products brand of high quality printing supplies on Amazon. 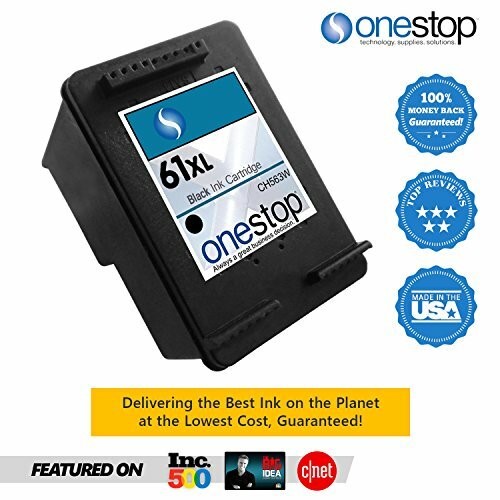 Compare prices on Printer Ink Hp Envy 5530 at ShoppinGent.com – use promo codes and coupons for best offers and deals. Start smart buying with ShoppinGent.com right now and choose your golden price on every purchase.